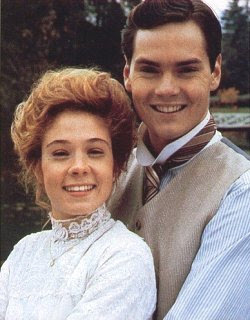 "I'm glad you spell Katherine with a K. Katherine with a K is so much more alluring than Katherine with a C."
I was waiting for BB8 to start so I turned to KBYU because Anne of Green Gables was on. It was right at the part where Anne said this quote and then Miss Brook changed the letter on the blackboard to a C. It was hilarious. No one is more dramatic than Anne - except for maybe Jen on BB8. I almost donated $325 to KBYU so I could get the gift of all the books and all the DVDs. Then I remembered that I could just buy them if I wanted for a lot cheaper and KBYU gets my money in a round about way cause I'm a full tithe player. Who doesn't love Anne? When Matthew died, I cried. When Gilbert called Anne "Carrot", I wanted to cry - I can relate. I remember sitting on the floor in Ann Dee's room before bed listening to my mom read from the book. I loved Gilbert Blithe - he is soooo hot. He's much cuter in the movie than in this picture. A few years ago I saw Anne play a lesbian on E. R. - very fitting. I'm not going to buy the books or the movies. You are hilarious! We just watched Anne of Green Gables and Kelsie was glued to the tv. I would love to go see the "lake of shining waters" someday! Great blog! Keep 'em comin'! Matthew looks down shyly and says, "Puffed sleeves." Ann replies, "The puffiest in the world!" I could watch all 24 hours of it a million times.